And, whilst most of us hear the word 'differentiator' weekly, if not daily, within the corridors of power, I've seen many organizations (from the many I've worked with across Europe, NA and Asia) struggle to get this area right, whether they're a mainstream product/service provider or, for instance, a professional services firm. Note: if your company does not talk about this topic, I'd suggest they do - unless, that is, growth is already exceeding all expectations. · 'how' you sell and serve: advice, relationship and customer experience are often key. 1. No internal consensus: Providers are unclear themselves on their differentiators. When you ask the key executives to list these, they each give you answers which are often quite different and conflicting. Without internal alignment, how can there be a focused external message? 2. Lack of clarity on strengths versus differentiators: One is what you're good at but not unique in. 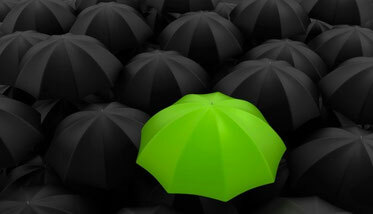 The other is, you guessed it, areas where you're different from, and outperform, your competitors. 4. Evidence: There's often a lack of hard proof supporting the differentiator. Therefore, it's just viewed as a claim which won't stand up to scrutiny. 5. Customer/client impact: The 'so what?' is what really matters. How do each of your differentiators make a quantifiable difference to the strategic objectives of your customers? At the highest level, these objectives are making money, saving money and managing risk. In some cases, your differentiators may have direct line of sight and impact on your customers' customers. Addressing these points is key for so many areas in your business, from new business or growing existing accounts to enabling executive conversations or responding to tenders. The reality is that when you ask end customers for their views of the key providers in their marketplace, suppliers are often viewed as the same. That's very different to how the providers view themselves, meaning they're often in a false state of belief. And one final point. If you feel you're on top of these areas, great news; however, do be careful not to shout early on in the sales cycle about your differentiators. Remember, at that stage buyers are thinking about their challenges and strategies, not what you sell. You need to have conversations that help them think about why they should change what they do before they start thinking about suppliers that could help execute that change. You're then in a great position to let them know just why you're the best company to help them.